Wow, it’s nearly the end of January! Hard to believe it. 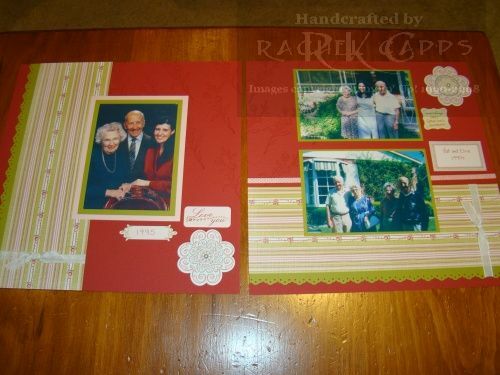 Anyway, this is another of the layouts I made for my step-Nan’s 90th album. This was her house as a child in Dulwich Hill. 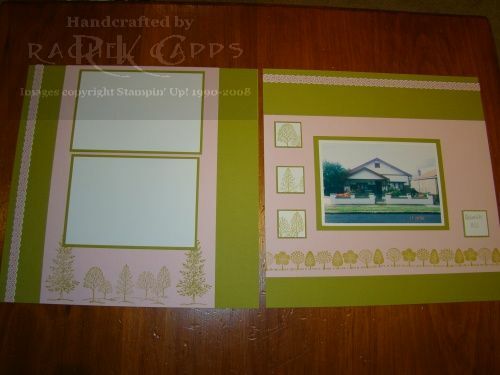 I kept this simple, simple colours – Kiwi Kiss and Pink Pirouette, and simple trees with the stamp set Lovely as a Tree and standard wheel Funky Forest. 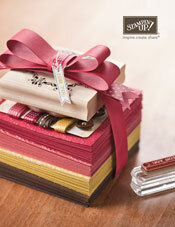 There is also a strip from the Simply Scrappin’ Sweet Nothings kit along each border of each page. Too easy! It’s been a while since I made this layout. It’s the fourth layout for my step-Nan’s 90th album. The photo isn’t the best, it was taken the night before we drove to Canberra last year for Nan’s 90th party. I think the red top my step-mum is wearing really ties in to the background colour I’ve used, Riding Hood Red. And I adore the striped DSP in this Simply Scrappin’ kit. To accent it more, I added an edge in Kiwi Kiss to the DSP, using the Eyelet Border punch. Then I’ve tied some white tafetta ribbon around the panel to finish it off. 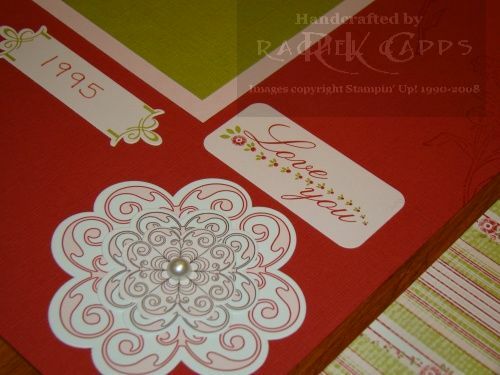 This is a close up of the detail, and the pearl from the Pretties Kit in the centre of die-cuts from the Simply Scrappin’ kit. I mentioned last month a big project I had to complete. Well, it was a scrapbook album for my step-Nan’s 90th birthday, which she LOVED, I might add. It was a lovely night with a lot of my step-mum’s family travelling from Sydney to Canberra for my step-Nan’s birthday. I managed to complete 13 pages in 3 days. So, over the next week, I’ll share the layouts with you. I still have a few more pages to scrap as well, so hopefully I’ll finish them soon too. This was my first attempt at a 12 x 12 scrapbook! I’ve used Baja Breeze textured paper for the base. Then I’ve used scraps of Parisian Breeze DSP for the brown corners (the scraps are from the front page layout of the album, which I’ll post soon) and two strips of the flower pattern from Parisian Breeze DSP. I then used Sahara Sand textured paper as a mat for the left hand page and Sahara Sand and Chocolate Chip paper to layer the photos on the right page. You can see I’ve used a Pretties Kit big flower and layered it with Flower Fusion Too felt flowers with a rhinestone brad in the centre. I’ve paper pierced, using my mat pack, around where the photos will go, so the photos are highlighted a little. I stamped the sentiment from Sense of Time on Sahara Sand paper, then layered it on Chocolate Chip paper. I sponged the edges of the Sahara Sand paper with Chocolate Chip ink to give an aged feel. The jumbo eyelet adds to the aged feel and I’ve threaded the eyelet with Baja Breeze coordinating striped grosgrain ribbon. I stamped the clock from Sense of Time in Sahara Sand ink on the left page, and in Chocolate Chip ink on the Baja Breeze textured paper on the right page. I then alternate stamped the clock mechanics stamp in Sahara Sand and Baja Breeze on both pages, so the clock images flowed from one page to the next. I used my square punches as diamonds to add the dates to each photo. Above is the double layout with photos. And lastly each page layout with photos. I left a few gaps on the first page so that my step-mum can add some jouralling too.